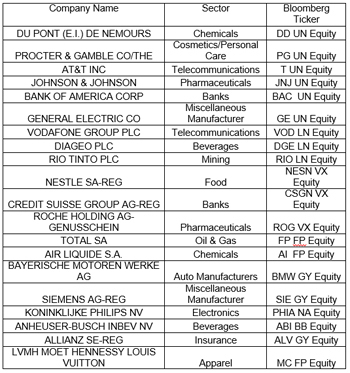 a)	An equally weighted portfolio of the following twenty (20) equities has been constructed. c)	For the first Calculation Period, the performance of the two highest performing equities is recorded and locked for the rest of the Investment Period at a minimum of 0%. For each of the above Calculation Periods:1) the basket of 20 equities is composed of locked equities from previous Calculation Periods (2 per each Calculation Period) and non-locked equities, 2) the performance of the two highest performing equities amongst the remaining non-locked equities is recorded and locked for the rest of the Investment Period at a minimum of 0%. d)	The Derivative Investment Strategy’s payoff at maturity equals the average of the locked performances of the equities in the basket at the last (10th) Calculation Period (the “Pay-off”). - primarily, investing mainly in a portfolio composed of bank deposits, money market instruments, debt securities, mortgage-backed securities and asset-backed securities. The Sub-Fund may not invest more than 20% of its assets in mortgage-backed securities and asset-backed securities. - secondarily, entering into, one or several, over-the-counter derivative transactions called Equity linked Swap agreements under ISDA (the “Swaps”) with the aim of meeting the Investment Objective. The effect of this transaction is that the Sub-Fund exchanges part of the returns on its portfolio for returns specifically tailored to the Investment Objective of the Sub-Fund. The Swaps’ termination date is scheduled to be December 18, 2024. Liquidities, securities lending and repurchase agreements may be used within the limits described in sections 3.1 and 4 of the Prospectus. The Directors will decide before maturity of the Derivative Investment Strategy, whether the Sub-Fund will be liquidated, prolonged for a new term with a new Investment objective and policy (in which case the prospectus will be amended accordingly) or contributed to another Sub-Fund of the Fund. Unit holders will be informed accordingly in due course after the maturity of the Derivative Investment Strategy. Should the Directors decide that the Sub-Fund will be prolonged for a new term or contributed to another Sub-Fund of the Fund, unit holders will be offered a one month period during which they will have the possibility to redeem their Units free of charge before such changes become effective. After the Swaps’ termination date and before the changes become effective, assets held by the Sub-Fund will be cash and money markets instruments only.